With simatherm induction heaters, bearings and other circular metal parts can be efficiently heated. Inductive heating is a fast and clean way to install circular parts onto shafts. It replaces conventional heating methods such as cooking plates, hot oil baths, open flames and ovens. During the heating process, only the workpiece heats up while the heater remains cool. 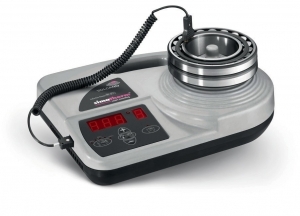 simatherm induction heaters are available for workpieces weighing up to 1200 kg.